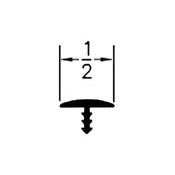 T-Molding can be ordered per foot or per metre and this can be selected at the time of order from the drop down options on the page. We stock a wide variety of colours including Chrome T-Molding & Black T-Molding and we even have wood effect colours such as Teak Effect T-Molding and American Maple T-Molding, which are a good choice for furniture or VW Camper Van projects. 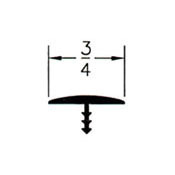 The most popular size is usually 3/4 inch, but we also stock 15mm, 1/2 inch and also 1 inch T-Molding. All the T-Molding we sell is very flexible and is easy to bend to go round corners or the edges of furniture or arcade machines. The plastic finish allows for easy cleaning; simply wipe clean with a soft damp cloth to ensure your furniture or arcade machine edges are always looking their best. To install T-Molding, you need to use a slot cutter to cut the slot in the wood. 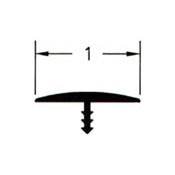 Once the slot has been cut, the t-molding can be knocked into the slot with a soft faced hammer or rubber mallet. If the slot has been cut correctly, the T-Molding should be a nice tight fit. A small bead of glue in the slot prior to fitting T-Molding is sometimes prefered to ensure a more permanent fit. We also sell T-Molding sample packs - these are ideal for customers who can't decide which of the great colours to order or for customers who want to colour match their project before ordering a roll of T-Molding.